I've been sweltering in my winter velour dressing gown so I decided I needed a new summer one. I also like to water the garden in the morning before I get dressed so I needed something for that, just in case the neighbours look over:). Choosing the material was the hardest bit. I spent hours going through the American Craft Cottons - I love them so much and chose an expensive one with gold cotton in it and sort of Japanese looking only to find when I got to the counter that there wasn't enough left on the bolt. Just my luck. In the end I went for a cheaper Voile from Sportlight which was only NZ$9 per metre. I did french seams to make it look tidy. 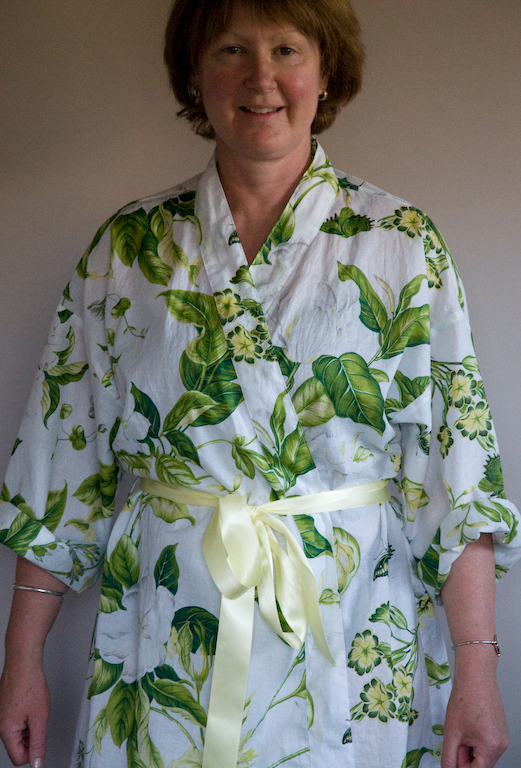 I love the lemon ribbon sash for a belt and only put it on by chance when one of my Xmas present came wrapped with it. Next time I would make the gown a little longer. (I didn't show you my knees!) The pattern is one I bought on TradeMe (a whole box of 60 patterns for $5 and $18 for postage. lol). But worth it since patterns here can be between $10 and $20 each. Voila with my Voile! A garden gown for the garden!